Internet Explorer After hitting F12, you have to click the console tab. 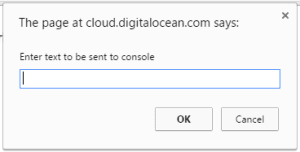 You’ll receive a dialog prompt to enter the copy to paste in. Please note that you need to click on the VNC console and hit enter to execute the command. If you need to enter more than one command, just hit the up arrow on your keyboard in the console to get the script again for easy reuse. Today I ran into a strange issue where Firefox version 28 and below rendered style widths different than Firefox 29 and above. Firefox 29 and above appear to have fixed the issue and render sizes to match Chrome/IE8+/Opera/Safari. Unfortunately, as old as Firefox 28 is, our client’s legal review team is stuck on that version as IT refuses to let them upgrade. As such, we needed to add a kludge fix to the site to add a style to fix the issue for those running older Firefox versions. JQuery removed the version support from version 1.9 so here’s a handy script that will allow you to detect the browser and version without any extra dependencies. BONUS: If you need to detect a specific version and add special classes, here’s a quick snippet that will allow you to add a class to the HTML tag using plain old vanilla.js.